NEW YORK CITY -- About 100 naked people have gathered in New York City to paint the town red - and blue, green, orange, magenta and neon yellow. Dozens of artists used the naked bodies as canvases for Saturday's third annual NYC Bodypainting Day, which celebrates freedom of artistic expression and body acceptance. The volunteer models doffed their duds in Manhattan for a few hours of painting. They planned to board double-decker buses to take their art show throughout the city. Onlookers shared words of encouragement while snapping photos and shooting videos on their cellphones. 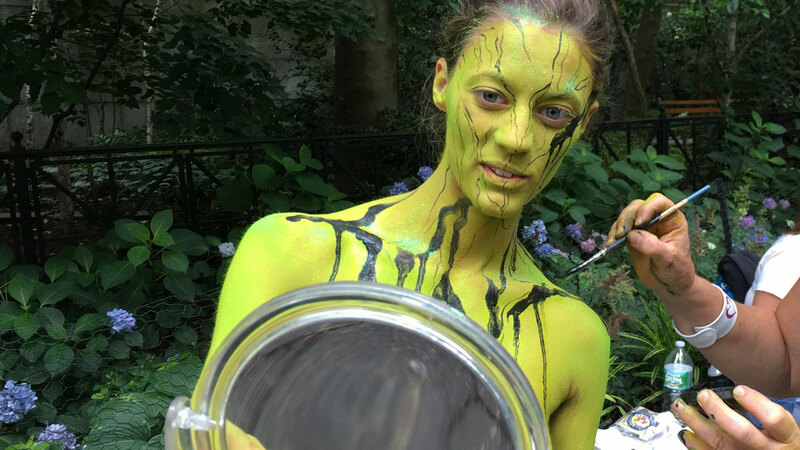 Artist Andy Golub created NYC Bodypainting Day as a way to promote human connection through art. He says he and the other artists are creating art inspired by the models' "inner beauty," the theme for this year's event.